Sometimes plans can change. I keep putting off my WIP. My current excuse is that I am sick, and don’t want to crochet my germs into the project. 😉 Why are there projects that just don’t want to be finished? Or that just scream “Noooooo” when you go to pick it up? 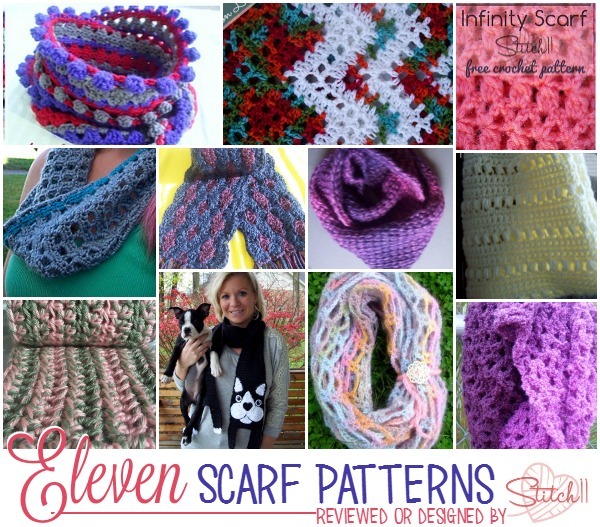 To make up for lost crochet time, I decided to put together a round up of all the scarf patterns I have written or reviewed. Each one of these was fun to finish and only scream “MAKE ME!” ha ha! I will list/link them from the top, left to right.